You can hear the rumble of distant thunder when dawn trembles with rain, but there would be no clouds this day as the sun splashed uncontested about the sky to bear a crumb of higher temperatures on the swift surface below. And there she sat, on this Saturday, August 15th, like a jewel across the seamless grass, the Historic Stockton 99 Speedway ready to accept race #18 of the NASCAR Whelen All-American Racing Series, in all her glory. On the bill of fare for the evening, the Western Late Models serving up Twin-50’s, Grand American Modifieds, ALSC/Street Stocks and the never-a-dull-moment Bombers. After stepping aside for a week to allow the SRL their time in the spotlight, the Western Late Models were on hand to serve up adult portions of double entrees at 50 laps each. These races were filled with so much flavor, the fans in the stands could not help but to savor the memories for some time to come and leave them hungry for more. The first 50 lapper got underway with Frank Farran (30) of Ione and Brentwood’s Doff Cooksey (57) at the head of the pack with Cooksey nabbing the holeshot and holding on until lap 5 when Tracy’s David Philpott (50) slipped below the #57 and assumed the point, and there he stayed until lap 32 when mechanical woes forced him to duck into the infield and end his solid run, but at the same time, handing the lead to son and Points Leader Justin Philpott (05), who happily accepted his rightful inheritance, and to show his appreciation, he went on to win his fourth race of the season. “A couple laps before my dad pitted, I could smell his motor was letting go and I was just hoping he would get out of the way and didn’t put too much oil down where it would spin me out and lose this opportunity to win this race,” said the very respectful Philpott, “It’s tough for him, but it’s pretty good for me in points. I love him, I appreciate everything he does and I appreciate all these people coming out to watch.” Todd Corral (16) of Modesto came home second while Tim Spurgeon (86) of San Ramon was third with the Legendary Dave Byrd (78) of Seaside fourth and Atwater’s Carlos Vieira (51) was fifth. The second 50 lapper featured Modesto’s Jeff Belletto (12) and David Philpott (50) starting on point with Belletto jumping to the early lead and holding tight until lap 12 when he began to slow on the track due to mechanical problems and on lap 16, he finally exited the track which ended his night. Meanwhile, Philpott (50), whose crew did a wonderful job getting his car fixed and ready for this race, continued his legacy by being in position to take over the top spot on lap 12 and cruising to his fifth win of the year. The race would be marred by two cautions on lap 25 and 36, but would be of no consequence to the final outcome concerning the leaders. “In the first race, the rear-seal in the extension housing let go, or Justin, you wouldn’t have won the first one,” said the elder Philpott to his son, “I don’t believe I’ll be able to catch him in points, but I just want him to keep running like he’s running.” Carlos Vieira took a couple shots at passing Philpott, but finally had to settle for the number two spot. Dave Byrd finished a consistent third with the Young Gun Philpott and Todd Corral making up the top five. For the second course, you had to make room for a heaping helping of Grand American Modifieds as they brought their own special texture to the racing surface in the form of light and fast, which in many circles, would not mix well. But in racing circles, it’s the perfect blend. This Division’s mission is to provide quality satisfaction to everyone involved. Fast Freddy (29) of Stockton and David Crouch (2) of South Africa started their bid from the front row with Freddy jumping to the lead at the green, but Groveland’s Paul Henry (4a) made a wickedly beautiful move going into turn one and stole the lead away on lap 1 bringing with him Points Leader Michael Ostrowski (17) of Salida who, much to Henry’s dismay, took over the top spot on lap 4 and held on through the next nine circuits until lap 13 when “The Scientist” Scott Winters (24) of Tracy, starting shotgun on the field, grabbed a monstrous hunk of forward bite coming out of four to overtake Ostrowki in one of the greatest fetes of driving many had ever witnessed. From there Winters continued to chew up the racing surface like it was laid out to appease his own personal appetite as he pulled away to his ninth victory in a row at Stockton. “It took a little luck to make it up from the back. We were fortunate enough to start on the bottom and that line moved, so that always gives us a little benefit,” said the always gracious Winters, “I wanted to get out front as soon as we could because I knew Jason (Philpot) and Ostrowski were going to be tough so I wanted to get out front and run our own pace.” Jason Philpot (15a) of Sacramento, quiet for most of the race, managed a very solid second-place run. Ostrowski finished on the podium in third with Rick Anderson (11a) of Roseville bringing her home fourth and Henry slipped back a little to finish in the fifth position. As an appetizer, the ALSC/Street Stocks brought their spicy-hot condiments to the table in such a fashion that would tickle the taste buds of even the staunchest race critic. Saving the best for last does not always hold true, especially when it comes to these guys as they always put on a delectable presentation for all to enjoy. Adam Coonfield of Riverbank, in a borrowed #50, and Stockton’s Leroy Hunt (61) brought this one around to green. Coonfield would launch to the lead and from there he would go unmolested to the checkers for a wire-to-wire, first-ever victory at Stockton. In the meantime, a half-lap back, the real war was going on for second between no less than four cars. It was a delicious battle over turf, but in the end it would be Adam’s brother, Aaron, with the lion’s share of the spoils. “It took bad qualifying to start on point,” said a joking Coonfield, “I did my best. I didn’t wreck it but I drove it hard, so Zack (Huffman) will have four new tires, I’m pretty sure.” Points Leader Jeff Ahl (31) of Lodi held on to finished third with the #31x of Mark Squadrito bringing home a very impressive fourth and Brock Monroe (42) of Lodi finished fifth. On a side note: It was certainly a pleasure to have Mike Graham (93) of Hughson back out to the track after a few years absence. 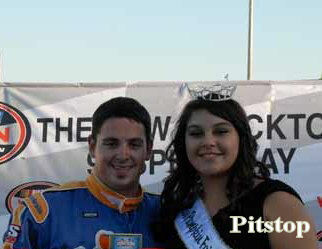 Mike raced at Stockton for a number of years before its closing in 2006 and was always very competitive in the Street Stock Division with several wins to his credit. There are some cultures that prefer dessert as a pre-cursor to all that lies ahead. And, Stockton 99 Speedway, in all her diversity, just so happens to be such a culture as the Bombers were prepared, in all their colors and flavors, to get this gala underway. The #029 Fast Freddy Jr. and Points Leader Ben Lewis (22), both of Stockton, got this one going from the front row with Lewis pacing the field until lap 17 when he went spinning down the back stretch and handed the lead over to the #4 of Stockton’s Tom Dahl who gladly took on the responsibility, but his joy would be short-lived as the first yellow of the night was displayed on lap 23 when Freddy Jr. and the #555 of Craig Petz choreographed a tandem spin coming off four and down the front stretch wall. Unfortunately, the finger of fate was pointed at Dahl which relegated him to the tail-end of the field. On the restart, Lewis squirted from the pack to the front until lap 29 when Peggy Sue Jarred (313) of Stockton looped it up off turn four in a solo spin of her own. On the restart, Lewis would pull away to take his tenth checkers of the year. “I was really glad be back in my primary car. This feels great,” said Lewis, “I would like to thank everyone for the help, especially my dad, and all the people who show up to watch.” Dahl rallied back to finish second while “Redneck” Russell Johnson Jr. finished third with the #007 of Mike Massone and the #808 of Lisa Johnston rounding out the top five. Next Saturday, August 22nd, Kids Night at Stockton 99 Speedway Presents the NASCAR Whelen All-American Western Late Models, Grand American Modified, ALSC/Street Stocks and the Bombers. ATTENTION: Kid’s Night at Stockton 99 Speedway will be August 22nd. “BIG WHEEL RACE” is for ages 2 thru 10 with no cost to participate, just bring your Big Wheel. You can sign up now thru August 15th. Please mark your calendars and don’t miss this one. All Junior’s are half price for the evening. For Further Information Contact Kid’s Night Coordinator, Brenda Mays at (209)649-2727 or the Speedway Office. 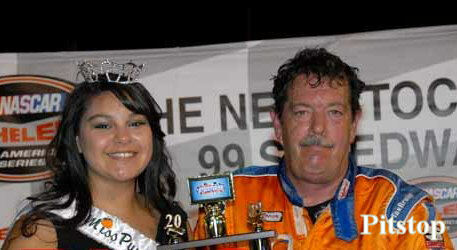 The New Stockton 99 Speedway is located at 4105 N. Wilson Way, ¼-mile west of Highway 99. For more information on tickets and times, please contact the Speedway Office at (209)466-9999. And remember, Stockton 99 Speedway is Always Family Friendly. 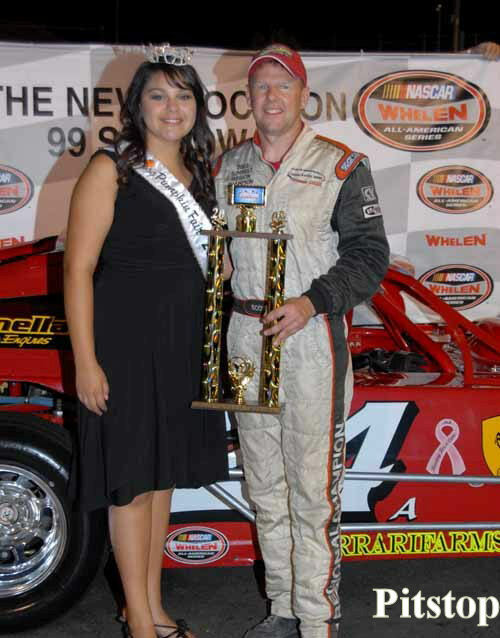 (08-15-2009) Justin Philpott came out on top in the Western Late Model racing at Stockton 99 Speedway Saturday night, finishing first with a total time of 12:01.141. Finishing with a best lap time of 14.190, Philpott edged second place finisher Todd Corral by 1.177 seconds and third-place finisher Tim Spurgeon by 6.116 seconds. Justin's father, Dave Philpott, finished with the best lap time at 14.143. Scott Winters of Tracy finished first in the Grand American Modified -with a time of 9:43.270, followed by Jason Philpott in second at 9:45.699 and Michael Ostrow-ski in third at 9:47.564. Adam Coonfield took first in the ALSC/SS at 10:32.515, and Ben Lewis won the Bombers race in 19:26.330.